Okay, I've got to give mad props to Mary Lee over at A Year of Reading for her post that bumped this book up on my to-read list. Her heartfelt recommendation resulted in me grabbing this book off our shelves, like, the next day. And it was such a good decision! 1. It's set in a time period (1909-1911) that fascinates me. 2. It's about spunky girls. Three of them, in fact. 3. It's about three spunky girls who are very different from each other (but also very much the same). 4. It's about three girls that I pretty quickly came to care about. Yetta, for one, is not going to put up with the abuse any more. She's also a young girl working at Triangle. Yetta's from Russia and she moved to America to join her sister who fled Russia fearing persecution for her socialist tendencies. Yetta and Rahel are committed to fighting the factory bosses. They want a strike. They want a union. And Yetta will stop at nothing to make a difference. Jane, on the other hand, isn't even aware of the strike or the poor condition of the factory workers. She's from a wealthy American family and the most that's expected of her is to marry well so she can put on pretty dresses and serve tea to a group of insipidly boring women. Jane feels trapped in her gilded cage until one day she meets Eleanor, a student at Vassar who tries to enlist Jane in the fight for women's rights. Jane begins to drive down to the factories to observe the strikers. Although her father doesn't approve, Jane feels like she's being called to help... if only she knew how. These three very different young women come together and eventually form a strong friendship. 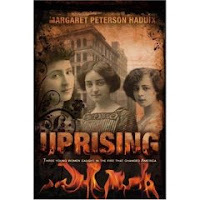 And then all three are involved in the tragic fire at the Triangle Shirtwaist Factory. You can find more blog reviews at A Patchwork of Books and Sara's Holds Shelf. If it's on your TBR list, I highly recommend bumping it up! Great review! I'm glad my review bumped the book to the top of your to-read pile and that you liked it as much as I did! This book is amazing i have just finished reading it! It was so powerful...and I cried in the end because I was extremely connected with their friendship! And...it really made me think about death and how it could come in a flash. So now Im realizing the things I need or want to do before I go.